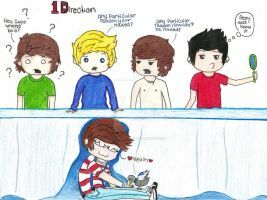 I love how you drew Louis! He's SO cute! so cute!!! I love 1D!!! AHHHH!!!!! I might DIE of CUTNESS! Well, acutally, I really don't have anything to tutor. I just did that one a one-try basis, and it just ended up like that. Ok i will try that and that is true. Thanks for the advice. So Cute and Perfect! Good job! o mi god love them!